Well friends, we are halfway through the first month of 2019, and for me, January epitomizes the doldrums of winter. The holidays have passed, but spring is still a long way off. As far as I'm concerned, there's no better way to beat the winter blues than by taking advantage of some great fabric sales and getting plenty of time at my sewing machine. To help you conquer the cold, I've rounded up all of the happenings at my favorite shops on the web, and there are even a couple of giveaways this month, so read on! First up is Shabby Fabrics. At Shabby Fabrics, they not only have tons of great fabrics year round, they also have some of the cutest seasonal projects around. These little projects are perfect if you don't like to decorate your whole house for each season, but want just a little touch here and there. 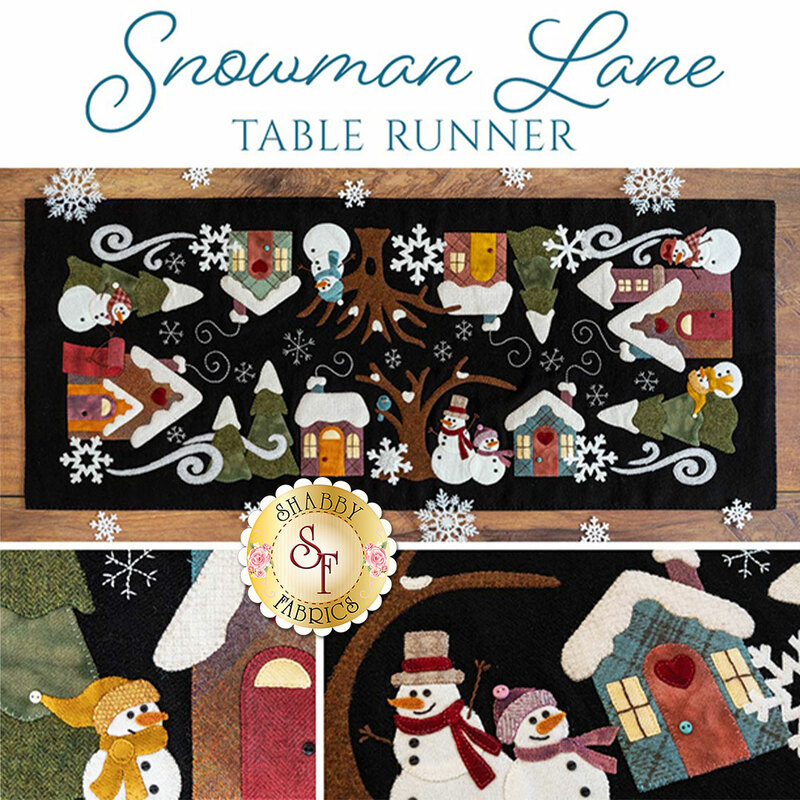 This Snowman Lane wool appliqué kit is so whimsical and fun, and a perfect compliment to a winter tabletop. Check out all of the details HERE. Shabby Fabrics also has a great new series if a table runner seems too ambitious. Their wool appliqué mug rugs are an easy way to dip your toes into the technique. I love that this is not a club with a commitment for the year. Instead you can just purchase the kits each month as you like. Just look at the adorable January design. 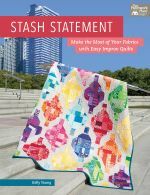 Each kit makes two mug rugs, and if you're still unsure about it, Shabby Fabrics has even put together a video tutorial to help you along. You can find the January mug rug kit HERE, and their tutorial video HERE. Shabby Fabrics is generously giving away one of these cute mug rug kits to a lucky reader. Hooray! 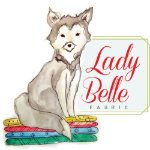 At Lady Belle Fabrics, there are lots of great things going on. 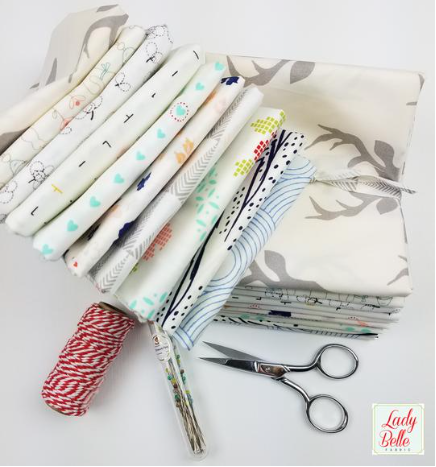 Did you know that Lady Belle has recently launched their longarm quilting services? Brooke at Lady Belle quilted my Farmhouse Charm quilt beautifully, and I know she would love to quilt something for you as well. Take a look at all of your options HERE. In their fabric shop, there are always deals to be found, along with beautiful new arrivals like Maureen Cracknell's Sun Kissed collection. Just gorgeous! If you're a low-volume lover, Lady Belle has the perfect club for you! 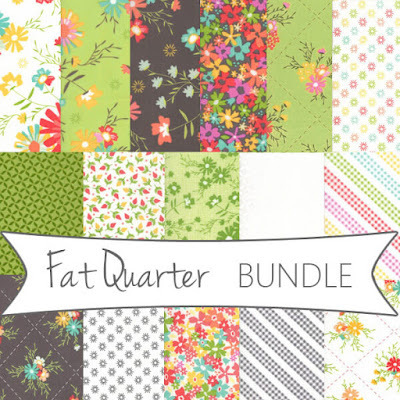 Their Little Whispers fat quarter club contains ten beautifully curated fat quarters each month, so you'll never run out of low volume staples. Find all of the details HERE. 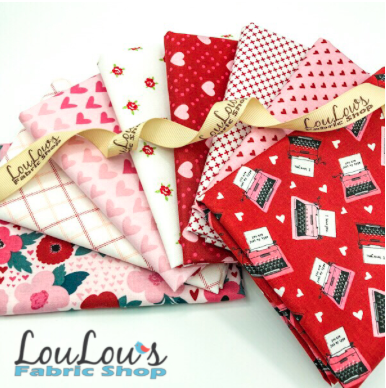 LouLou's Fabric Shop is here to help you get a jump start on your Valentine's sewing with some sweet fabrics, and an even sweeter deal. Just use the code Valentine for 15% off of your entire order (excluding sale products). If you're a real deal hunter, you know that shopping off-season is the best way to get amazing prices. 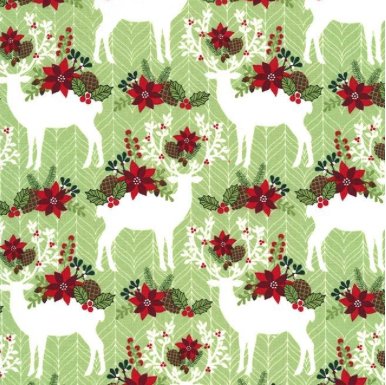 So, if you're looking to build up your Christmas stash for next year, LouLou's also has ALL Christmas yardage on sale right now. 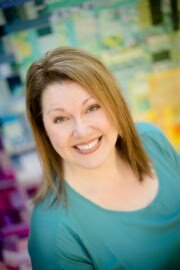 Last, but certainly not least is Fort Worth Fabric Studio. At FWFS, they're having a sale on the Sunnyside Up collection by Corey Yoder, including all kits, bundles, precuts, and yardage. I just love these fresh colors and prints. You don't need a coupon to take advantage of this deal. Just head over HERE before January 22nd, because that's when the sale expires. Also at FWFS, check out these gorgeous heron and guitar embroidery scissors! 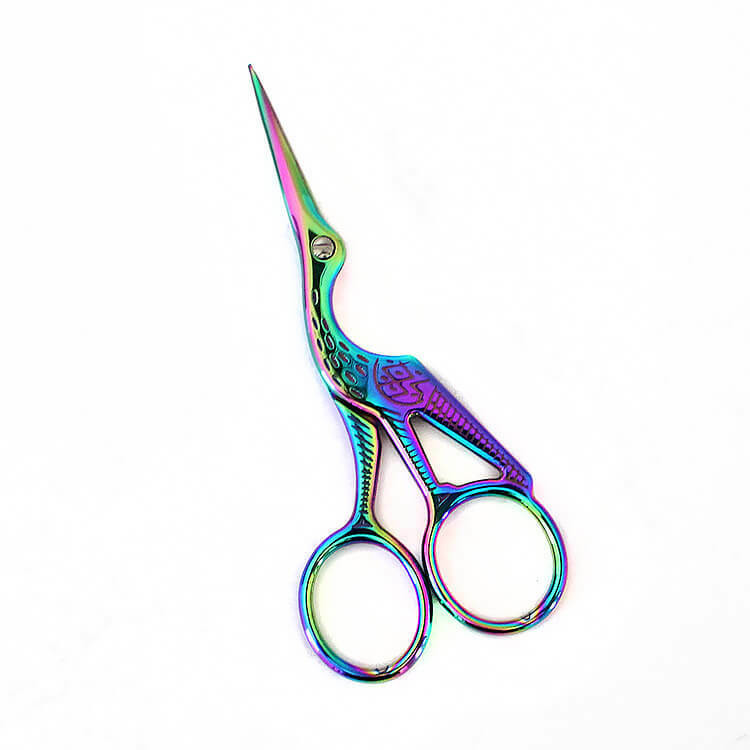 The rainbow coloring and fun design are a perfect way to add a little flair to the mundane task of snipping threads. You can find them HERE. 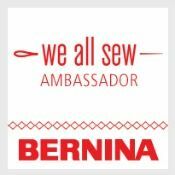 Fort Worth Fabric Studio is sponsoring the second giveaway of the day, and generously offering a pair of heron embroidery scissors to one lucky US winner. I hope I've given you some fun ways to fight the frosty weather. Before you go, take a minute to leave a single comment on this post to enter the two giveaways. If you are not in the US, please let me know! Additional replies/comments/entries are always deleted. I'll announce the winners at NEXT week's NTT (January 23rd). Stay warm, and happy shopping! the scissors are beautiful and i love wool mug rugs. Wow! 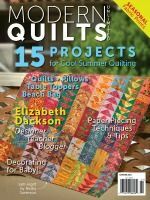 All sorts of quilting goodness to get in trouble with! Thanks for sharing. Cool Scissors! Thanks for sharing all of the sales, I need to find some monkey fabric! The wool pieces are beautiful. Someday I'll try wool. Love the wool mug rugs and the embroidery scissors are really cute. Thanks for the chance to win. Thanks for the chance to win. I love those scissors. Thanks for the links! Everything is so sweet! I love the heron scissors! Appreciate the links and giveaways! I am loving the heron scissors! Spring can't get here fast enough!!!! love both the heron and the guitar scissors, so cute! Thanks for hosting these giveaways! Those mug rugs are adorable! 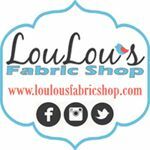 I'm going to check out ShabbyFabrics right now! Thanks for sharing the eye candy and great deals. That snowman runner is just amazing! Fun give aways! Thank you and your sponsors for the chance to win! Thanks for sharing. these shops are always my go to shops for great deals. 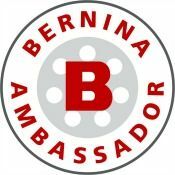 Thanks for all the info and a chance to win!! Fun projects and great fabrics. Thank you for the giveaways. Thanks for the heads up on the great deals! I love those guitar snips!! Thank you for the opportunity to win. That little mug rug is so cute! I LOVE the Farmhouse Charm quilt! I hope to make one some day! I get slightly hypnotized when I see scissors like that...love the colors and effect! I am in the middle of a low volume quilt. Thank you for the introductions. 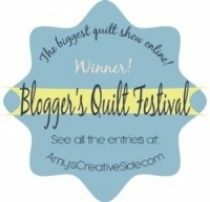 I so enjoy your blogs and quilt patterns! I love the little wool mug rugs and I have wanted to try wool applique. Two great giveaways. You have the best sponsors - clicking from home is a great way to beat the winter doldrums! In Canada, but have a US shipping address. 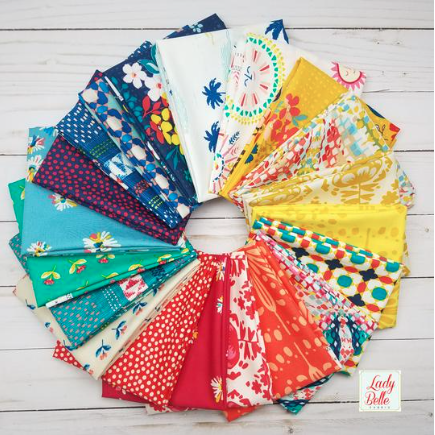 Gorgeous fabric at Lady Belle and your Farmhouse Charm quilt is beautiful! Such generosity from quilt shops far and near. Thanks for the giveaways. I am in Canada. What great giveaways--I'm ready to start the mug rug just as soon as I get it, lol. I enjoy your blog and love looking at the great projects! Thanks for sharing. 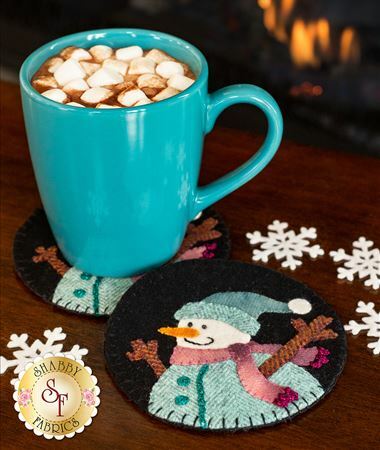 The snowmen coasters are adorable! I've already downloaded the pattern but would love to win the kit. Thanks for the giveaways. These scissors are beautiful. What a nice giveaway for January. Thanks for sharing all of the pretties. I love the guitar scissors! You always have fabulous giveaways! You are so right...doldrums!! And in the last two weeks we have gotten a couple of storms that left 5" of snow each. This morning I spent some quality time with the snow shovel!! We are currently under a blizzard warning (4th time in 20 years) for the lovely storm that plans on marching across the entire country!! Thank you for the pick-me-up with all the eye-candy on your blog today!! Oooh I love the low volume fat quarters-such a great idea! 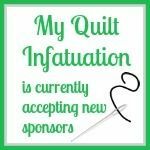 I'm in Newfoundland, Canada and the winter here is very cold & loooong-ugh, so time spent in the sewing room is a definite must! I’ve got some “winter blues” going on. Looking forward to spring. I'm loving the extra time in the sewing room with these shorter days, otherwise, I'd be outside gardening! With all this “weather” I’ve got tons of time in my sewing studio! It’s been great! Something about playing in Quilty fabric projects just makes me feel cozy! I love those scissors! My husband and I have a thing for herons. And the typewriter fabric is fantastic! My sewing space is still a wreck from Christmas. I'm getting inspired to get it cleaned up so I can sew again. I don't think I'm a no-reply blogger, but just in case Chiskag at gmail dot com. Thanks so much for the chance! Thank you for all the great links to some great eye candy! I am a Canadaian but have a USA mailing address if I’m lucky enough to win! Oh my gosh! Those little snowmen are so stinkin' cute! I will have to order the pattern for the runner and check into their club, it looks like fun! 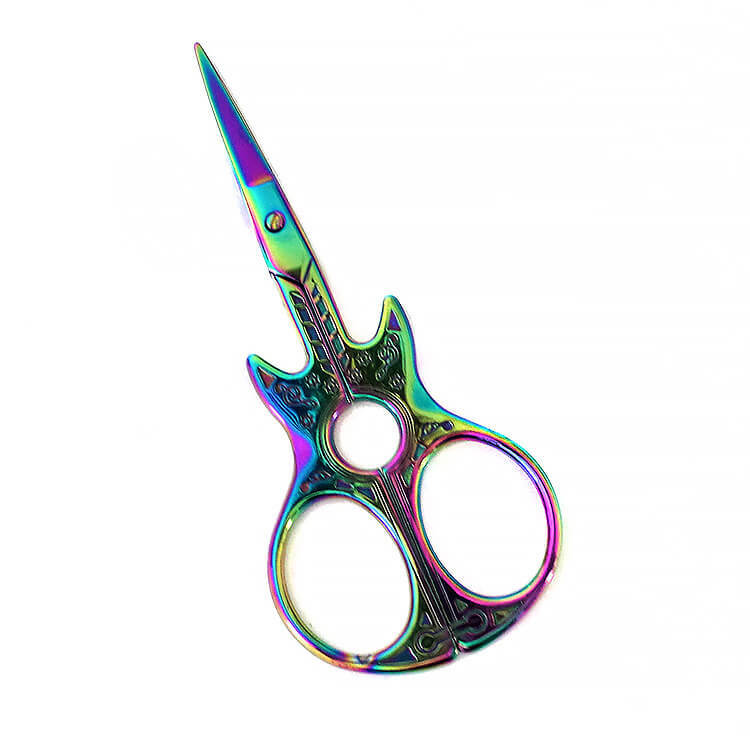 I have never seen iridescent scissors - thanks for the giveaway and profiling a new product. Wool applique is fun and those kits are adorable! The scissors are beautiful!